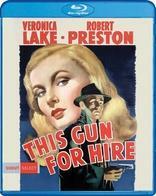 One of Hollywood's classic hard-boiled thrillers and a favorite of suspense film lovers, this picture marked the first hit pairing of tough guy Alan Ladd, in the role that made him an instant star, and sultry blonde bombshell Veronica Lake. Adapted from a novel by Graham Greene, This Gun For Hire is the edgy story of love, power and betrayal set in the seamy underworld of the 1940s. Philip Raven (Ladd) is a cold-blooded professional killer who's been double-crossed by his client. Ellen (Lake) is a beautiful nightclub singer who's spying on her corrupt boss. Lt. Michael Crane (Robert Preston) is a dedicated cop who wants Ellen's love and Raven's capture. The tension mounts steadily ... and before the case is wrapped up, someone will pay with his life.